(Left to Right) Denny Shepherd, George and Debbie Henry, Taylor Broermann, Michelle Lovely, and Joe Scholler take a photo after Broermann was presented with the award at the Eaton High School award assembly. EATON — Taylor Broermann, a 2015 graduate of Eaton High School, has been named this year’s recipient of the G. Matthew Henry Memorial Scholarship. Broermann, the daughter of Mike and Lisa Broermann, plans to attend Miami University in the fall. Joe Scholler, a friend of Matt’s, presented the scholarship at the Eaton High School awards assembly. The G. Matthew Henry Memorial Scholarship was established by his parents, George and Debbie Henry, and his sister, Michelle Lovely, in memory of Matt’s pursuit of integrity and academic excellence. 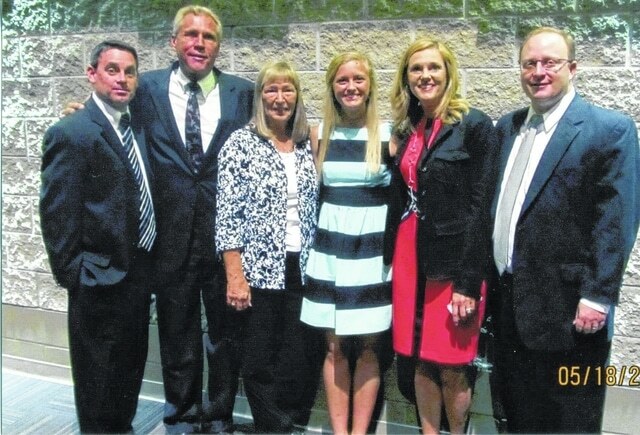 A $1000 scholarship is awarded each year to a promising senior of Eaton High School. In June of 2000, Matt, at the age of 25, passed away while playing basketball. He was a loyal friend to many, a dedicated student, and a role model for his peers. Henry graduated from Eaton in 1993 and DePauw University in 1997. At the time of his death, he was a customer team finance manager for Procter and Gamble. Contributions may be made to the G. Matthew Henry Memorial Scholarship Fund, in care of the St. Clair Foundation at LCNB National Bank, 110 West Main St. in Eaton.